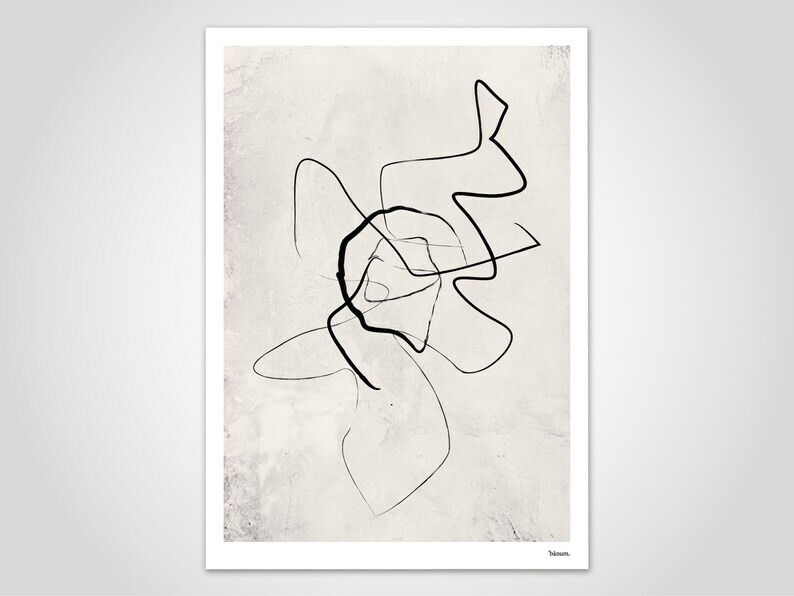 Enjoy banum's creative art prints. Whether in the apartment, in the office or as a gift: With the modern illustrations and abstract graphics, you decorate your walls in a contemporary and individual way. With that in mind: Make art your life! Item still not received 15 days after purchase. Delivering a parcel from Germany to the UK shouldn’t take this long. Unacceptably slow service. Won’t buy from again. Toller Spruch - super Grafik, super Posterqualität. Farbe wie abgebildet. Tolle Einkaufstasche mit dem Design 🐵 Affen! Payment is made in advance, stating the order number and first / last name, as well as by Paypal, bank transfer, cash on collection. Payments must be made no later than 10 days after the end of the sale. (1) The vendor and contracting party for the merchandise presented in the Etsy-Shop “banum” is Banu Sensöz, Wolfgang-Bangert-Str.1, 60438 Frankfurt am Main, Germany, phone +49(0) 1733568530, e-mail mail [!at] banum.de . (1) The vendor is offering the articles presented in the Etsy Shop “banum” for sale to other Etsy users. The colors of the articles shown on the website may vary slightly depending on the internet browser and monitor settings used by the customer; these variations are technically unavoidable. (2) The selection of merchandise, conclusion of contract and implementation of the agreement shall all take place in German. (3) The vendor shall deliver the merchandise to destinations in Germany as well as to all other countries of the European Union, Liechtenstein, Norway and Switzerland. (4) The customer shall select the merchandise desired by placing it in his “shopping baket” or by clicking on the button “Proceed to Checkout” (“Zur Kasse gehen”). The order will be conclusively placed with the vendor by clicking on the button “Place Order” (“zahlungspflichtig bestellen”). Until the order is transmitted to the vendor, the customer has the opportunity to review, at any time, the data input when placing the order, to modify them or to completely discontinue the order. (5) The vendor is making a binding sales offer for the merchandise presented in its shop. By transmitting the order using the button “Place Order” (“zahlungspflichtig bestellen”), the customer accepts the sales offer. The vendor shall confirm the conclusion of the contract by e-mail (contract confirmation). (6) The content of the contracts concluded is stored in the vendor’s and the customer’s Etsy user accounts and may be viewed by the customer at any time in the Etsyportal by clicking on the item “My Purchases” (“Meine Einkäufe”) in the Etsy menu. (7) The vendor shall inform the customer by e-mail of any impediments preventing the delivery from being made, or of any other circumstances that might prevent contractual performance. does not show the VAT. (2) The shipping costs are listed in the respective product description under “Payment & Shipping” (Bezahlung & Versand). (3) Where deliveries are made to Liechtenstein, Norway or Switzerland, customs or acquisition tax for imported goods may have to be paid by the customer to the customs authorities upon receipt of the shipment. These duties will accrue in addition to the purchase price and the shipping costs; the vendor has no means of influencing them. (4) The vendor shall deliver the merchandise – at the selection of the customer – against pre-payment by redeeming a Etsy voucher, against pre-payment by bank transfer or against pre-payment using PayPal. Together with the contract confirmation, the customer shall receive an internet link via e-mail connecting them to the “My Purchases” (“Meine Einkäufe”) site of the Etsy portal, which provides further information on the implementation of the purchase. a) For payments using a Etsy coupon, the customer may enter one or several coupon codes in the “My Purchases” (“Meine Einkäufe”) site of the Etsy portal. The coupon value will be credited to the vendor, and in this way the invoice amount will have been paid for. Where the coupon value is higher than the invoice amount, the coupon shall remain valid for the balance of its amount. b) Where the customer has selected “Bank Transfer” (“Banküberweisung”) as the form of payment, the vendor’s bank account details will be provided in the “My Purchases” (“Meine Einkäufe”) site of the Etsy portal. Exclusively transfers denominated in Euros and free of charge for the vendor shall be accepted for bank transfers from abroad. c) Where the customer has selected “PayPal” as the form of payment, the button “Click here to pay using PayPal” (“Hier klicken, um mit PayPal zu bezahlen”) will connect to the PayPal online service, from where payment can be made subsequently. (1) The vendor shall deliver the merchandise within 3-7 business days after payment is made. (2) For deliveries to destinations outside Germany, a period of 2-9 business days, depending on the destination, has to be added to the respective domestic delivery time. (3) If the customer’s order contains more than one product, all products will be delivered in one single shipment; for this shipment, the longest given delivery period for any of the contained products will apply. If the customer wishes a product to be delivered seperately in shorter time, he may place a seperate order for that product. (4) Where a delivery cannot be made because the customer has provided a wrong or incomplete delivery address, an attempt to once again deliver the merchandise shall be made only if the customer accepts to bear the costs of re-shipping the merchandise. The re-shipping costs correspond to the shipping costs agreed at conclusion of contract. (1) A customer purchasing as consumer is entitled to a right of withdrawal in accordance with the statutory pre-requisites. A consumer means every natural person who enters into a legal transaction for a purpose that is mainly outside his commercial or self-employed professional activity. (2) The vendor shall grant a 14 day withdrawal period to a consumer having his permanent residence outside of Germany also in those cases in which the national laws applicable to the consumer provide for a shorter period; in derogation herefrom, the withdrawal period for consumers who have their permanent residence in Slovenia is 15 calendar days. (3) The vendor shall allow any consumer having his permanent residence outside of Germany to transmit an informal declaration of withdrawal even in those cases in which the national laws applicable to the consumer provide for stricter requirements as to form. (4) The pre-requisites and legal consequences of the German stipulations as to consumers’ rights of withdrawal shall apply to consumers having their permanent residence in Switzerland also in those cases in which Swiss law does not provide for a right of withdrawal. Warranty claims shall be governed by the statutory regulations. (1) After the conclusion of the contract Etsy transfers to the vendor the customer’s Etsy user name and his full name and billing address as they are stored in the customer’s user account. If the customer has specified additional information with the order (eg a different delivery address or a phone number), it is also transfered to the vendor. (2) The vendor shall process the data referred to in paragraph 1 for the performance of the contract, shipping of the merchandise, invoicing and recording payments. For shipping purposes, the vendor may transfer the customer’s name and address to the contracted shipping company. (3) The data remains stored by the vendor until all claims arising from the order are fully fulfilled and until the applicable commercial and tax law retention periods have expired. (4) The customer may at any time request information from the vendor about the stored data concerning him. Furthermore, the customer may at any time request the correction of erroneous data. (5) The controller of data protection is the vendor referred to in section 1 paragraph 1. (6) To the extent a customer uses the services of PayPal for payment, the data protection provisions established by PayPal shall apply to the payment process. In this context, PayPal shall be taking action as the person employed by the customer in the performance of their obligations (Erfüllungsgehilfe), not as a person so employed by the vendor. 7) The recipient is only liable for any customs duties incurred. (2) Where the customer is a merchant, an entity under public law or special assets (Sondervermögen) under public law, the parties agree that the vendor’s registered seat shall be the place of jurisdiction. (3) Should individual provisions of the present General Terms and Conditions prove to be invalid or impossible to implement, this shall not affect the validity of the remaining provisions. All items are freshly printed after receipt of payment and shipped within 3-5 days. All prints are plotted on high-quality premium papers and with the latest printing technology. Every article, such as jewelery and asseccoires, is scrupulously and as well as possible described and illustrated with photos. Please note that there may be slight color variations due to monitor settings. Occasionally, plotting can lead to lightly striped print results that are technically unavoidable and therefore do not represent a defect. All articles have been created according to my own ideas and designs and are thus subject to copyright protection. They may therefore not be copied, altered, or otherwise used commercially! Copyright © 2018 banum / all rights reserved.